Those of you that have known me forever know I started working at McDonalds when I was 15 1/2 years old. I'm sure you all remember the CAMP SNOOPY glasses from McDonalds, but I bet you've never seen this one. There are only two ways to find the rarest of collectibles. Luck and networking. If you know someone who already owns it, money talks. For the rest of us, it’s all down to luck. Collecting is 50% luck and 50% having the available funds. There’s no point being lucky if you don’t have the money. Start saving your pennies and making your own luck if you want to get the rarest of the rare. The sixth McDonald’s Camp Snoopy glass is a very oddball collectible. It seems to be redrawn elements from the other glasses and a bit crudely done. For instance, Charlie Brown has the “Van Pelt” eyes. It would be interesting to know the history behind the glass. Perhaps because it wasn’t going to be released to the public, they didn’t need to get artwork approval. Or perhaps this was a prototype before the final artwork was completed. If anyone knows the story, please share! Among Peanuts collectors, the sixth Camp Snoopy glass is almost a legend. There aren’t many details about how many glasses were made. I knew it existed from a bad xeroxed page I had picked up along the way from someone. 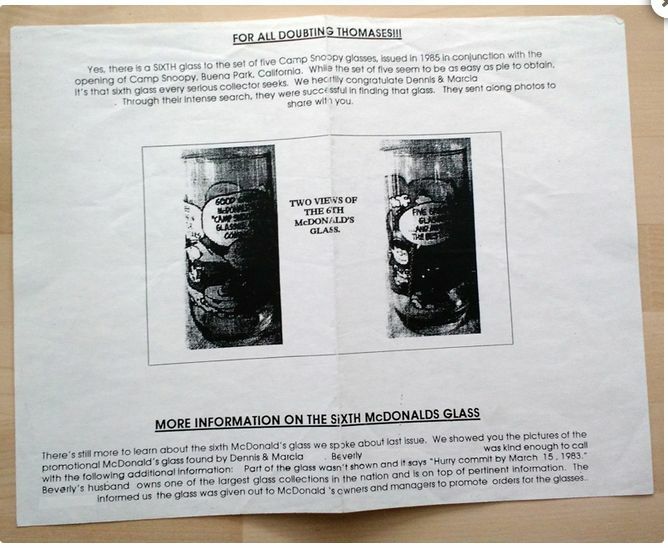 According to that sheet, it was originally a sample sent only to McDonald’s mangers to get them interested in purchasing the promotional glasses for their stores. This is why it is often referred to as “The Manager’s Glass.” At least one existed in the world. But could anyone find another? We make our own luck in Collecting. If you’re not out there looking, you won’t get lucky. I hadn’t been actively looking for the 6th Camp Snoopy glass, but it was always at the back of my mind. I was chatting online to a collector who specializes in promotional glasses. Did he have any clues? He knew of three others who had found one, but hadn’t found one for his own collection. My curiosity took hold after that conversation. I went to eBay to see what I could find. There was one auction for the sixth Camp Snoopy glass and it sold for $100. I poked around some more and came across a set of six Camp Snoopy glasses. Expecting to see a double of one of the common glasses, I took a closer look. But there were no doubles. Could it be? It was the rarest of the rare! I watched that auction for days. The days counted down to hours, the hours to minutes. No one had bid, so I did. I won with no other bidders. With shipping, I paid $30 for the set of six glasses. Just $5 for the most elusive of Peanuts glasses! About a year later, another collector contacted me looking for the same glass. As luck would have it, a couple days later I found a Craigslist posting for the sixth Camp Snoopy glass. It was 10 miles from the collector! He paid $350 for the glass, along with a few other items. Luck can go both ways. I had double luck in that I found the glass and the seller had no idea the gem he had. My fellow collector was lucky that his seller knew what the glass was and that helped the collector to find it. It’s easy to pass up Camp Snoopy glasses in stores and online because we’ve seen them so many times before. But you never know when you might get lucky!